In addition to the automobile exhibit, attendees will have the opportunity to participate in complimentary walking tours of the nearby Motor Row Historic District, home to dozens of early automobile showrooms in the early 1900s, as well as free tours of both the Glessner and Clarke House Museums. For more information, visit http://www.glessnerhouse.org/ or call 312.326.1480. In recognition of the car exhibit, one of several special events being held to commemorate the 125th anniversary of Glessner House, we present a few interesting tidbits about the Glessners and their early automobiles. -The Glessners purchased their first automobile in 1906 and it was delivered to the house on Monday November 26. Frances Glessner records the significant event quite simply in her journal, “Our Automobile came on Monday.” In all probability, the car was a Pierce Arrow Victoria Tonneau, similar to the one pictured at the top of the article, which would have cost the Glessners about $5,000, a huge sum in 1906. The Pierce Arrow dealership in Chicago, H. Paulman & Company, was located at 1321 S. Michigan Avenue, part of the emerging “Motor Row” district. -Cars were replaced fairly frequently. Journal entries record the purchase of new automobiles in May 1909 and January 1911. 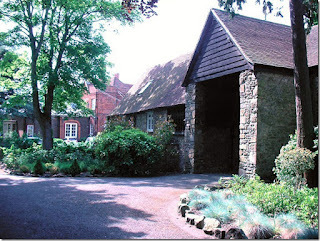 On March 7, 2011 we posted an article regarding a tithe barn at Abingdon Abbey in Abingdon, Oxfordshire, England. The building, depicted in a photograph owned by the Glessners at the time they first met with architect Henry Hobson Richardson in 1885, became a primary inspiration for the architect who took the design of the structure and made it the “keynote” of the Glessners’ new home on Prairie Avenue. In May 2012, members of the Abingdon Area Archaeological and Historical Society (AAAHS) found the blog article and started an interesting communication with the museum. Unaware that the building depicted in the photograph had served as the inspiration for the internationally recognized Glessner House, they set out to find out what they could about the structure. Most interesting of all is the fact that the building is in fact NOT the tithe barn at the Abbey. That structure, which was converted to an Anglican church in the 1960s, has similar lines but is clearly not the same building. Further investigation uncovered the actual building depicted in the photo, which remains standing today. 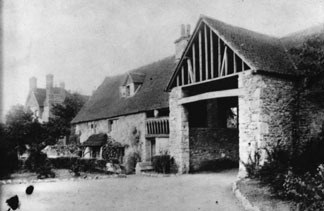 The building’s historic function was that of a carriage entrance to the stable block for the Cosener’s House (partially visible at far left), the residence of the abbey kitchener or “cuisenier,” the person at the Abbey responsible for the provision of food. To the left of the carriage entrance was the gardener’s cottage, which was most likely rebuilt on the site of a derelict abbey fulling mill after the dissolution of the Abbey. As an interesting side note, the Cosener’s House, located on an island across the River Thames from the carriage entrance structure, is operated today as a conference center with accommodation by the Science and Technology Facilities Council. Visit http://www.stfc.ac.uk/About+STFC/44.aspx for more information. The lingering question that remains unanswered is how the Glessners came into possession of their photograph of the building, and why they placed it on display in their home. They never visited the site and in fact never visited England at all, focusing mostly on France, Germany, and Italy during their one and only trip to Europe in 1890. The original photograph owned by the Glessners (with its ink blot at the corner added by Richardson during the time he had it in his possession) is not in the museum collection today, so it is unknown if any notations existed which might yield a clue to the source of the photograph that served as the keynote of the house we know today as Glessner House Museum. On Sunday June 10, 2012, Glessner House Museum will hold its 15th annual fundraiser, A Walk Through Time. This walking tour explores the interiors of the historic mansions in the Prairie Avenue Historic District. Featured are eight privately owned buildings, in addition to the Glessner and Clarke house museums, and Second Presbyterian Church, with its significant collection of Tiffany windows. The tour runs from 1:00 to 4:00pm and costs $50 per person. For more information or to make reservations, call 312.326.1480. One of the featured properties on the tour is the Calvin T. Wheeler House at 2020 S. Calumet Avenue. The brick Second Empire style house was built for Wheeler, a banker and member of the Chicago Board of Trade in 1870. It was designed by architect Otis T. Wheelock. In 1874, Wheeler sold the house to Joseph Kohn, a prominent Jewish wholesale clothier. When his family sold in the early 1900s, the house was acquired by a publishing company and converted to offices. Later, it was purchased by the Murphy Butter & Egg Company for use as a warehouse. By the 1900s, it was sitting vacant, deteriorated, and threatened with demolition. The current owner, Debra Seger, acquired the property in 1997 for just $10,000 and spent the next eighteen months renovating and restoring the building. In 1999, she opened the house as the Wheeler Mansion, a boutique hotel with eleven guest rooms and suites. It is the last surviving mansion on Calumet Avenue and was designated a Chicago landmark in 1998. The house is an excellent example of the Second Empire style, with its trademark third-story mansard roof. The elaborate brackets and cornice at the roof line were recreated during the restoration based on a historic photograph. The two-storey copper bay window was not original to the house and was probably added by the Kohns in the 1880s. Upon entering the house, guests would have seen the elegant entry vestibule, which still retains both its original mosaic tile floor and beautiful beamed ceiling with Lincrusta panels set in between. The first floor features a gracious center hall plan which would have provided beautiful cross-ventilation in the days when the Lake Michigan shoreline was just a few hundred feet to the east. The tall ceilings and heavy mouldings are typical of the style. The most dramatic feature of the hall is the original ceiling which was meticulously stripped of multiple layers of paint and restored to its original colors. The flat sections are Lincrusta, the deeper trim portions are cast plaster. To the north of the hall is the staircase with its original hand rail in the Aesthetic style, influenced by Japanese design. The stairway is illuminated by a large skylight filled with beautiful leaded glass added during the restoration. The parlor features an antique mantel from England that is much older than the Wheeler house itself. Pocket doors separate the room from the adjacent dining room, and would have been used by the live in staff to close off the dining room while it was being set before dinner and cleared after the meal was complete. The dining room features an intricate beamed ceiling with Lincrusta panels at the four corners. The wallpaper is not original but is appropriate to the period. During the time the house was used by Murphy Butter & Egg, a large loading dock surrounded this part of the house, eliminating all the windows. Across the hall from the dining room is the current hotel office which originally served as the butler’s pantry where food would have been brought up from the basement kitchen by way of a dumbwaiter.